Humanism is an ethical life stance that places human values at the centre of its philosophy. It’s about compassion and reason – it’s about taking responsibility and treating others with respect. Humanists base their understanding of existence on the natural world and its evolution and not on a belief in the supernatural – finding values in people themselves. You can find out more on humanism.ie and by reading the Amsterdam Declaration 2002. I live in north Dublin and am available for naming ceremonies, weddings and funerals. 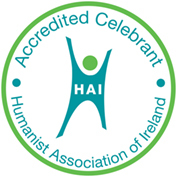 I was accredited as a celebrant by the Humanist Association of Ireland in 2014. It really is a pleasure and a privilege to work with families and couples to mark those all important milestones in life with meaningful ceremonies and a sense of community – without a requirement for religion. 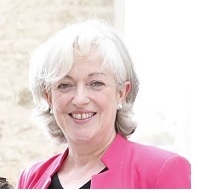 My working life, before becoming a Humanist celebrant, included a few years as a radio presenter in the 80’s, television production in the 90’s and the best part of twenty years in the e-Learning industry as a script writer, voiceover and production manager. I was born in Cork and lived there until, sadly, my father died in a plane crash near Tuskar Rock off the Wexford coast in 1968. The family moved to north Dublin the following year to be closer to extended family on both sides and that is where I grew up. I returned to Cork to work and to go to college – doing a BA in European Studies and, a few years later, a post-grad in Computer Science – both at University College Cork. I am often asked how I came to Humanist ceremonies… it was a long process I suppose, but specifically it was early in 2012 when I realised this was something I wanted to do and had the skills to do. I had already been closely involved in devising non-religious ceremonies in my own family. I was raised a Catholic, but had moved away from religion as a teenager. The first occasion when that really mattered was when my son was born in 1989 and I had just turned 27 – I knew I wasn’t going to have him baptised and yet I wanted to mark his arrival with a celebration for family and friends and appoint “godparents” – and so I did just that – in my sitting room. My next ceremony was something similar for my daughter in 1999. During those years raising two children without religion, I became very aware of how people can miss out on ceremonies and celebrations and that sense of community that are traditionally associated with the churches in Ireland. When my mother died in 2006, myself and my siblings arranged a funeral service for her. It took place in our local RC Church and was conducted by a priest who was a family friend, but the format and content was pretty much made up by us. My brother, Paddy, died just four years later, and once again we as a family devised a funeral service for him – this was held in The Island crematorium in Cork and looking back now, it was essentially a Humanist funeral. We had readings and music and shared memories and most importantly we celebrated his life as a community of his family and friends. I was the “celebrant” on that occasion. Soon after Paddy died, myself and my partner of many years decided to legally tie the knot and get married. We were married by a state registrar in a civil ceremony in a Dublin city centre venue. As wedding planner in chief, I found myself very interested and involved in the format of the ceremony – I wanted to make sure that, as well as including the legal declarations and signing of the register, it was a ceremony and a celebration that brought our guests together as a community and made them feel welcome and engaged. And it was. I reached the big five-oh birthday  in 2012 and among several changes I made around that time (including ditching the hair dye and embracing the grey!) I decided to seriously pursue becoming a non-religious celebrant. That led me to the Humanist Association of Ireland (HAI) and the rest, as they say, is history. I joined the HAI in Spring 2012, started volunteering by working on the newsletter, was co-opted on to the Board a few months later and served on the Board for almost four years, three of them as Chair.